Does eviction qualify for CGT Relief? Is plastic surgery tax deductible? 1. Does eviction qualify for Capital Gains Tax Relief? I had a farm tenancy for over 15 years and as a condition of the tenancy, I lived in the farmhouse. The tenancy has ended and I am being evicted without any compensation. I have a house which I bought before taking on the farm tenancy and am selling the property to reinvest into a new property, which I can then live in and let rooms out to produce an income, as I have nothing else. My property has tripled in value during the time of the tenancy and my solicitor has told me I potentially have a large capital gains liability. I’m being evicted so it seems very unfair to pay tax as well; is my solicitor right? Being evicted does not per se qualify for exemption from CGT; however I do have some good news. The most recent Income Tax Act Section 222(8), effectively allows your private residence to qualify for CGT Relief by allowing Principal Private Residence Relief to apply, even though you haven’t lived in the property for 15 years. The key condition is that your tenancy agreement must clearly state that you must live on the farm as a condition of the tenancy, if it does, then CGT does not apply. I am a sole trader with only a modest profit, so to make ends meet; I have employment income from three separate part-time jobs. The first 2 employments are paid under PAYE schemes, but the 3rd is paid without any tax being deducted. The small firm said all of their workers are part-time and earn less that the tax threshold, so they don’t have a PAYE scheme. How do I declare it, or can I just ignore it? If you ignore the income, then HMRC would see that as deliberate tax evasion. Clearly employment No.3 has got it wrong, but it is your responsibility to declare it under the employment pages of your tax return and pay any tax due. I have run a small property letting company for many years and am now selling up to retire, as I’m now 70 years old. On retirement I will have the money from the sale of my business (in the region of £120k), plus I deferred my state pension at 65 and the lump sum is around £36k. I currently earn £40k p.a. which will cease on the sale of my business and subsequently, the only regular income I will have will be my state pension, which will be £7,709p.a. What tax can I expect to pay? Your question involves two possible areas of taxation, CGT on the sale of your business and Income Tax. 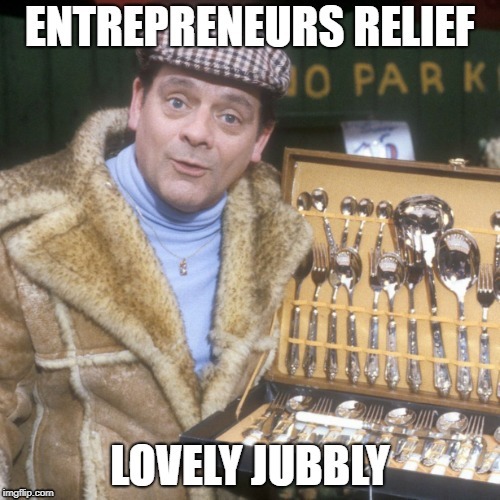 Firstly, regarding your business, it would appear that you are eligible for Entrepreneurs Relief, which is a scheme that is open to directors who own 5pc or more of a company, and which allows them to enjoy a 10pc tax rate on capital gains up to a lifetime limit of £10m which compares with the 28pc rate of tax payable without the relief. Any Income Tax payable will largely down to when you receive the £36,000 deferred pension lump sum. Your state pension is under the tax threshold, so in itself won’t be taxed, however tax on the lump sum will entirely depend on which tax year it is received. If you receive it in the year that you receive salary and are a tax payer, you will pay tax of 20% on the lump sum. If however the lump sum is received in a tax year when you’re a non-taxpayer, it will be paid without any tax being deductible. I am a small builder and have not been involved in the Construction Industry Scheme of deducting tax from subcontractors before. I took on my first subcontractor in June and paid him gross, with no tax deductions. I’ve just realised my mistake, so what is the correct way to sort this out? Do I just amend the CIS return (originally filed blank) and state no tax was deducted and will that lead to penalties? Trying to claw back the CIS deduction from the subcontractor now will be very difficult, help! This happens quite often, but I’ve never known HMRC take punitive action as long as it’s an isolated case. Strictly speaking, you have to pay the tax you should’ve deducted plus a £100 penalty; however, if you amend the CIS return and enter zero deductions, HMRC will have a record of the payment to the subcontractor, and you haven’t concealed anything. In my experience HMRC will merely note the subcontractor’s record and take no further action unless you make another similar mistake. 5. 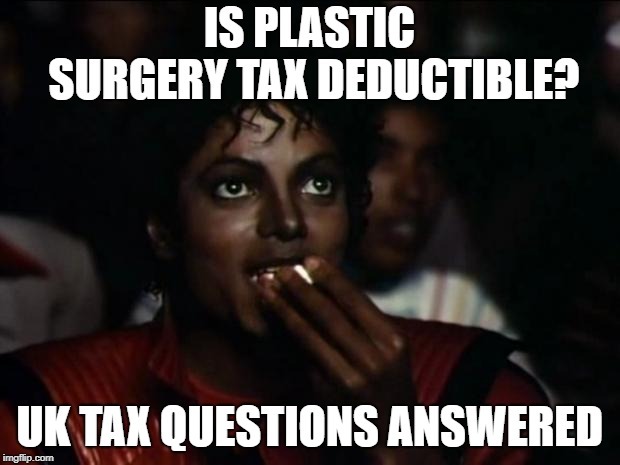 Is plastic surgery tax deductible? I have hooded eye syndrome, which in essence is excess skin at the side of my eyes which is affecting my vision. My doctor tells me that my peripheral vision is around 65% of what it should be and as it’s a deteriorating condition, he will have to inform DVLA in Swansea very soon and they will immediately suspend my driving licence. As I’m an urgent parcel courier, not being able to drive will effectively close my business. The blepharoplasty operation can be carried out on the NHS if the loss of vision reaches 35%, but in reality my doctor says that unless its 40%, they will say its borderline and ask me to come back for a further assessment, typically 18 months later. Also, as its elective surgery, my doctor says that even if I pass the assessment and qualify, there’s a 2 year waiting list. I can have the operation privately quite quickly, but is the cost of around £4,000 deductible as an expense against my tax? I have every sympathy for your position, however in order for the cost of the operation to qualify as a deductible expense; you will need evidence from your doctor. In essence, if he/she provides you with a medical report that clearly indicates that DVLA are likely to withdraw your licence well before the likelihood on an operation on the NHS, then I consider that you would have a good chance.